Yes, Ben Irani is a true scientific tattooist. 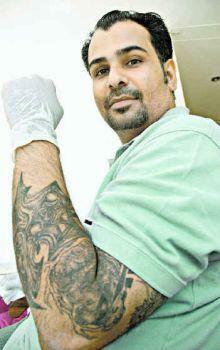 He’s a tattoo artist, painter and a chemical engineer rolled into one. His rendezvous with tattoos began at 16 when he got his first tattoo. And after that their was no looking back. He engineers on crazy skins in his own studio in Mumbai. He was inspired by tattoo artist from Marilyn, Robert Gale, of Capital Tattoos, who polished his passion for the body art and taught him the skills. Along with all this he went on through his escapades in digital and fiber optics and chemical Engineering. Apart form his profession the art “keeps him sane” as he says and helps in too. “I see things in a lot more detail. I’m very meticulous about the tattoos I do,” says Ben. While the details make all the difference, the overall package is also greatly influenced by the demanding day job. “I have a broader vision of art, I see it differently from most other artists,” he explains. For Ben tattooing is an art of uncontrollable excitement. It’s a deadly blend of abstract art and engineering concepts, churning out impeccable designs. His own body is marked for life with interesting people and friends revealing his life story.